Ancient indian MetallurgyTechnology means the application of scientific knowledge for practical purpose. It can also refer to machinery and equipment developed from such knowledge. In ancient India there is a large number of evidence to suggest the prevalence of scientific and technological knowledge. Many of them were linked with the religious belief system prevalent at that point of time. To begin with the archaeological remains of the Indus Valley reveal the knowledge of applied sciences. Scientific techniques were used in irrigation, metallurgy, making of bricks and pottery, and in measurement of areas and volumes. The artefacts found from the sites suggest that Harappans developed metallurgy of copper and bronze about 2500 B.C. However, the technological knowledge in India actually had an uninterrupted run since the Vedic age. It’s seen there was a close relationship between religion and the advancement of technological knowledge. The foremost among them were in the fields of Mathematics, Astronomy, Medicine, Physics and Chemistry. It’s roughly by third century BC that the scientific knowledge got segregated and the disciplines of Mathematics, Astronomy, Medicine and others made separate stride in its development, even though its application remain interdisciplinary. A large body of written text and the inscriptions found over a period of time gives a vivid account of scientific and technological knowledge in ancient India. Aryabhatta In ancient India, mathematics was known by the general name Ganita, which included arithmetic, geometry, algebra, astronomy and astrology. In the field of mathematics ancient Indians made three distinct contributions, the notation system, the decimal system and the use of zero. The greatest contribution of ancient India to mathematics was the development of notation system. This was done by giving a value for each position in incremental of 10. A notation for powers of 10 up to the power 17 was in existence from the Vedic times. The mathematician Aryabhata (A.D. 476-500) in his book Aryabhatiyam, clearly mentions “sthaanam sthaanam dasha gunam,” meaning from place to place increase 10 times. The decimal system too was an innovation of ancient India. Indians were the first to use the decimal system. The earliest epigraphic evidence of the use of decimal system is found in the inscriptions of Ashoka in the third century B.C. The famous mathematician Aryabhata was acquainted with it. Zero was discovered in about the second century B.C. From the very beginning Indian mathematicians considered zero as a separate numeral, and it was used in arithmetic in that sense. The mathematical implications of zero and infinity were fully realized in the field of astronomy. The earliest inscription regarding the data by a system of nine digits and a zero is dated 595 A.D. It’s evident that the system was known to the mathematicians some centuries before it was employed in the inscriptions. In the second century B.C. Apastemba contributed to practical geometry for the construction of altars on which the kings could offer sacrifices. It describes acute angle, obtuse angle, right angle etc. Early Indians devised a rudimentary algebra which led to more calculations. Aryabhata gave approximate value of pie. He formulated the rule for finding the area of a triangle. 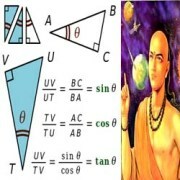 Aryabhatta, gave a new direction to the field of trigonometry. It also led to the evolution of empirical geometry and calculus. The most famous work during his time was Suryasiddanta, a book on Hindu astronomy. During the Gupta period mathematics developed to greater heights. 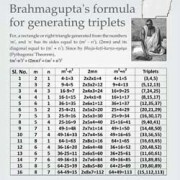 Brahmagupta in 628 AD wrote the book Brahmasphuta-Siddhantas or rules for numbers. It contained ideas including a good understanding of the mathematical role of zero, rules for manipulating both negative and positive numbers, a method for computing square roots, methods of solving linear and some quadratic equations, and rules for summing series. This book was written completely in verse in Sanskrit. Indian mathematicians such as Brahmagupta (7th century), Mahavira (9th century) and Bhaskarachary (12th century) made several discoveries. They understood the importance of positive and negative quantities, evolved sound system of extracting squares and cube roots and could solve quadratic and certain types of indeterminate equations. 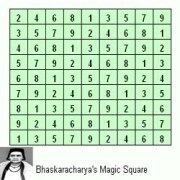 Bhaskara Among the various branches of mathematics, Hindus gave highest importance to astronomy. Astronomy was studied as a Vedanta and was called Jyotisa. During Vedic period a primitive kind of astronomy was in vogue mainly for the purpose of settling the dates and times at which periodical sacrifices were to be performed. Suryasidhanta is the best know book on Hindu astronomy. The text was later modified two or three times between 500 A.D. and 1500 A.D. The system laid down in the book is used to predict eclipse even now. The most renowned scholars of astronomy were Aryabhata and Varhamihira. Aryabhata belonged to the fifth century and Varahamihira to the sixth. Aryabhata wrote the book Aryabhatiya when he was barely 23 years. He calculated the position of the planets according to the Babylonian method. He discovered the cause of lunar and solar eclipses. He measured the circumference of the earth. He pointed out that the sun is stationary and the earth rotates around it. Varhimihira who lived in the sixth century A.D wrote Brihat Samhita another well-known work on astronomy. Varhaihira stated that the moon rotates around the earth and the earth rotates around the sun. He utilized several Greek works to explain the movement of the planets and some other astronomical problems. Varhmihira wrote a summary of five astronomical books current in his time. He called one of his five astronomical systems as Romaka Sidhanta. Brahmagupta Brahamagupta in his book Brahmasphuta - Siddhantas appreciated the value of observation and astronomy and his book was translated into Arabic. One last outstanding mathematician in India was Bhaskarachary who was born in modern Karnataka. He wrote the book Siddhanta Siromani, a treatise on astronomy. This four-part text book was written in 1150 AD when Bhaskara was 36 years old. The work is composed in Sanskrit and has 1450 verses. The people in ancient India had considerable knowledge of Medicine. In the field of medicine, Ayurveda is the most significant contribution of ancient India. Seven hundred hymns in Atharva Veda refer to the topics of Ayurveda. The Vedic hymns attribute various diseases to demons and spirits and the remedies for hymns prescribing correctly the symptoms of several diseases. The importance of medicine gained currency from 800 B.C. Medicine became a regular subject of study at centers like Taxila and Varanasi. The latter specialized in surgery. The physician was a respectable member of society and the Vaidyas mostly Brahmins were ranked higher in the social hierarchy. India witnessed two famous scholars Charaka and Susrtua who made considerable contribution to the field of Ayurveda system of medicine. Charaka in the second century A.D compiled the teachings of two of his predecessors who served at Taxila and called it Charakasamhita. Charakasamhita is considered to be the encyclopaedia of Indian medicines. It describes various types of fever, leprosy, hysteria and tuberculosis. For its treatment Charaka lays special emphasis on cleanliness and on diet. His book contains the names of a large number of plants and herbs which were used as medicine. Charakasamhita is useful not only for study of ancient Indian medicine but also for ancient Indian flora and chemistry. In subsequent centuries Indian medicines developed on the lines laid down by Charakasamhita. Another book on medicine, compiled by Susruta in the fourth century A.D was Susrutasmhita. In this book Susruta describes methods of operating contract, stone disease and several other ailments. He mentions as many as 121 implements to be used for operations. It was only from the time of Susruta that surgery came to occupy an important place in Indian medicine. Charakasamhita and Susrutasmhita reached as far as Manchuria through translations in Tibetan and other Asian languages. In the eighth century A.D. these books influenced European medicine system as it was carried by two Arab travellers. Charaka Samhita was translated into Arabic in the 9th century A.D. and it was reprinted as late as 1550. Ancient Indian Achievements The knowledge of Physics was closely linked with religion that recognized many types of atoms and elements. In later period, some Buddhists school of thought conceived atom as the minutes object capable of occupying space in fastest duration of time, coming into being and vanishing, almost in an instant, only to be succeeded by another atom caused by the first. The Vaisesika School believed a single atom to be a point in space completely without magnitude. Further, most of the schools believed that atoms constitute molecules. 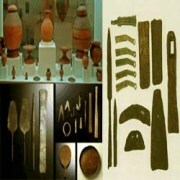 A great deal of progress was made in ancient India in the field of chemistry and metallurgy. The Harappans developed metallurgy of copper and bronze about 2500 B.C. The Vedic Aryans tanned leather, fermented grains and fruits, and dyed scale production of copper, iron and steel, brass, silver and gold and their alloys. Indian steel was highly esteemed and was exported in large quantities. It was from the seventh century, alchemy the forerunner of chemistry was referred to in Indian literature. The applied chemistry of ancient India did succeed in producing many important alkalis, acids and metallic salts. It is claimed by historian A. L. Basham that a form of gun powder was discovered in ancient India. The greater heights of knowledge of metallurgy and engineering in ancient India are borne by the discovery of pure copper statue of Buddha at Sultanganj. The famous iron Pillar at the Qutab complex in New Delhi also is a testimony to this fact. In the ancient India the technological advancement first originated for religious purposes. When the people became well settled and the agrarian mode of production started producing surplus food, the technological advancement gained importance. It’s only in the later Vedic period, more significantly in the Christian era, that the technological advancement made some real progress. There are huge amount of literature produced during that time that throws light on different facets technological advancements. This was particularly in the field of mathematics, astronomy, medicine etc.